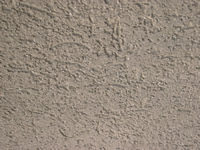 Over time, rain erodes the thin coating of stucco that contains the sand that creates the texture layer. When this happens, the texture can easily be removed if the wall is cleaned with a pressure washer, or with time as airborne pollutants and rain continue to erode the surface of the stucco. To prevent the loss of your texture, the stucco should be re-coated or re-stuccoed every 15-20 years. Your home re-stucco projects start with a careful evaluation of the wall surfaces to identify any areas needing repairs. Next we sandblast to clean and prepare the surface for the new stucco coat, removing about 1/8″ of the surface, and make any necessary repairs. Then we apply a thin coat of stucco called a brown coat (this would be step #2 in a 3-coat stucco application) to level out the surface of the the walls. This leveling coat will cover any inconsistencies in the finish it’s covering, and it gives the walls a smooth texture for the final color coat. The finish (color coat) is thin, and gives your home it’s unique stucco texture and color. We Service All Homes and Businesses in San Diego County. Contact us to see if we service your area.